Q: Why do I need an underground utility detection (UUD) survey ? A: It allows you to find out whats buried without any digging. This non-invasive method of detection is crucial in avoiding costly damages to assets or injuries/loss of life during 'blind' excavations. Q: Is it really necessary ? A: Local authority of certain high-density areas (e.g. Kuala Lumpur, Penang and Johor Bahru) may require UUD data to be submitted as part of the as-built survey in the application for a Development Order (DO). A recent customer inquiry involving a factory development in Subang shows that other municipal councils are imposing similar requirements. Q: Can Jurukur Perunding do a UUD survey ? A: Several JUPEM guidelines are evident of such work being undertaken by land surveyors. Work undertaken by our company can be endorsed by one of our licensed land surveyors. Q: What can you detect ? The timing of survey is crucial (for example, high water content during the monsoon season will affect the results). To recap, Jurukur Perunding Services Sdn Bhd is appointed as a reseller for the Gogopal M38 Personal Navigation Device (PND) since 2005. Its other capabilities also include video player, MP3 and photo viewer. Inquires should be directed to our sales personnel. Jurukur Perunding Services Sdn Bhd (and Jurukur Perunding World Service Sdn Bhd) received their ISO 9001:2000 certificate on 1st August 2003 from SIRIM QAS Sdn Bhd. The scope of services includes:- 1) provision of land, hydrographic surveying and aerial mapping services; and 2) provision of geographical information system (GIS), remote sensing (RS) and geomatic services. We are the first Malaysian land survey company to have achieved multi-site certifications (i.e. separately for our headquarters in Selangor and branches in Penang, Kedah and Melaka, respectively). Reciprocal certification from the Swiss-based IQNet Association was also obtained. Management wishes to express its appreciation to its advisor, Dr Loo Koi Sang, for his continual support and guidance. We are appointed as an authorised reseller of IFSAR products in Malaysia. A Sales and Technical Training was conducted on 5 March 2009 at JPSurveys' Head Office in Puchong, Selangor by technical experts (Mr. Jan Schoderer and Mr. Ian Seeton) from InterMap Technologies . InterMap Technologies is a US-based company that serves a growing Digital Elevation Model (DEM), Geographic Information Systems (GIS) and Geospatial marketplace. More than 20 of our employees (ranging from top management to production staff) attended the event. The Vice-President of Credent Technologies, Mr. Lee Sze Keong, was also present. The objective of this training is to enhance our technical knowledge on IFSAR (NEXTMap) data products availability for Malaysia. The country-wide data set consists of Orthorectified Radar Image (ORI), 5-m posting Digital Surface Model (DSM) and 5-m posting Digital Terrain Model (DTM). This was held in conjunction with the expected release of NEXTMap Malaysia product (tentatively scheduled for May 2009). An array of possible value-added products that JPSurveys can create specifically for the Malaysian user community (primarily comprising engineers, planners, and local government departments) using this data set was explored. There have been reports that we are confining our lady surveyors to the office. This is not entirely true! To show that we are not gender-biased in our company, the all-girl teams are being sent to some outstation sites located around West Malaysia ( re: CCI ) and Brunei Darussalem for their field assignments. Geoeye1, the world highest resolution colour satellite image has captured the first images over Malaysia recently. 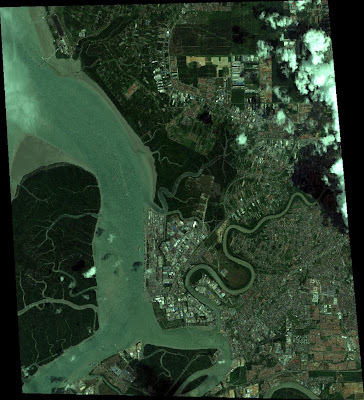 This following quicklook was taken over the Kuching , Sarawak. Please bear in mind that these two images are not at the full-resolution. Once the full-resolution sample is available, I will post it up. You are free to choose any one of these five options and the price is the same at USD42.00 per sq km (New Collection) for images over Malaysia (other conditions apply). From now until 31 December 2009, a special promotion is on. For GEOEYE1 images which are more than 90 days old, will be available at USD37.00 per sq km! With all the excitement generated by GEOEYE1, let's not forget the IKONOS which has been serving us with high quality images for the last 8 years. IKONOS image has gone down in price also. With the same 5 options, the New Collection price has come down to USD36.00 per sq km and the Archive images older than 2006 will be available at USD31.00 per sq km. This is our proven cost-effective method of acquiring reliable 2-dimension and 3-dimension spatial information. We take photographs from airplanes or helicopters. Such photos provide a visual evidence of the existing features at a particular point in time. There are also the options to buy existing (archived) photographs or acquire new ones from other sources. Contact us if you are interested in this service. Value-aided information may include overlays of land parcel information, administrative boundaries, computer-rendered building blocks and photo-realistic rendering. Yes, after some fine tuning, the PointsandPixels is ready to rock! Lets add a little excitement to JPSurveys by introducing our new Product Blog named "Points and Pixels". One of the reasons we introduce this new channel of communication is that we are going into a few new product lines which are relatively new. We need to provide a channel for users to feedback to us in a quick and informal way. 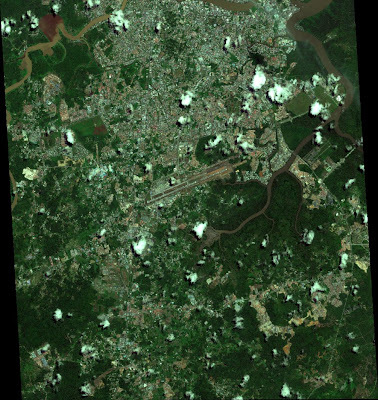 Firstly, being the authorized reseller of SPOTASIA, we are proud to announce that the World Highest Resolution Colour Satellite Image, GEOEYE1 is now ready to take commercial order after successfully calibrated. At 0.5m colour and an accuracy of RMSE3m in XY, GEOEYE1 has changed the whole meaning of satellite image interpretation. Secondly, JPsurveys is recently appointed as the reseller by Credent Technology to promote the high accuracy IFSAR Products covering the whole Peninsular Malaysia and Sabah captured under the INTERMAP NEXTMap Malaysia project. The package covers three exciting products, namely the Orthorectified Radar Image (ORI), Digital Surface Model (DSM) and Digital Terrain Model (DTM). All these producst have a high accuracy of RMSE 1m in XY. Thirdly, JPsurveys is also the appointed NAVCOM dealer, adding to our product line is a wide range of GPS equipment to facilitate your different need. So stay tuned for the announcement in this product blog. Welcome everyone to Point and Pixels, a place for informal exchange of ideas and comments of JPSurveys' products and services. Very soon, more exciting new products and services will be posted to keep all of you informed. Feel free to post comments and we take them seriously.